Whether setting a world record or a personal best, sports and vision go together. Yet in order to reach your goal it’s not enough to just define it. You must recognize your goal and do everything in your power to attain it. Sports frames by Adidas Eyewear offer an unobstructed view of clear objectives. Adidas glasses and frames are developed for athletes. Vision, protection, fit and durability are the main focuses to keep your vision in sight. 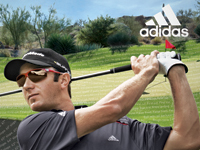 Check out Adidas Sports Eyewear at the Eye Place today!